For your convenience, we've placed only a few images on each page of this gallery. When you are ready, go back to pages 1 or 2 in this Gallery, or use the tags at the top to view other galleries on our site and place your order. Morning on the Mountain©. The best colors are often early in the morning and the early evening. You climbed this hill late last night. Wake up! Now, the morning light introduces you to the wonders that the desert mountains hold. But be careful of the cactus and remember that those yucca spines are sharp. Ocotillo Hillside. There has been a little rain on the mountain, and the gangly ocotillos are celebrating by leafing out and igniting the bright scarlet torches on their tips. 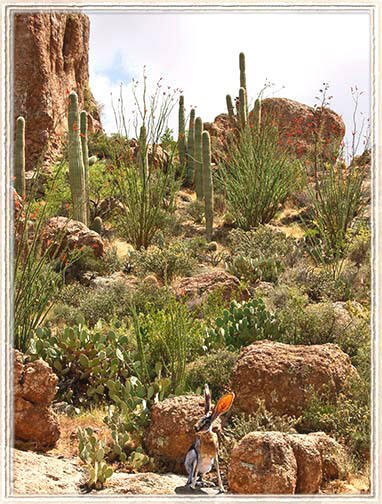 In a month, the prickly pears will take over the mountainside with a profusion of yellow blooms. In the meantime, a jack rabbit surveys the situation, unsure what makes the best lunch among all the possibilities being offered. Snow in the Desert©. 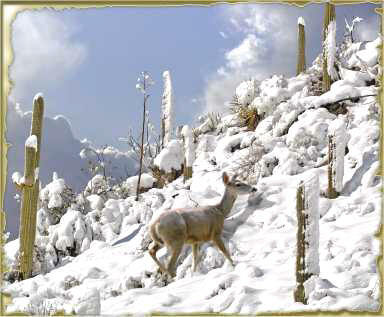 Yes, it does snow in parts of the Sonoran Desert. This particular part lies north of Tucson and east of Phoenix where a late winter storm has crested the Superstition Mountains and blown across the southern ridges of saguaro, sage and ocotillo. The deer didn’t look warm, but at least she had plenty of water. The next day, the snow was completely gone. Sonoran Desert Morning©. Ah, the mornings are wonderful with sunny sides of the many cacti, trees and even distant mountains brilliantly contrasting with their long shadows. Watch the alternating illumination and shadows as they creep across the desert floor. In each moment, the pattern subtly and silently changes. Spider Rock©. Think of it as a towering remnant of a by-gone era. Spider Rock is all that remains within the enormous canyon carved out of rock by the seemingly tame stream on the floor of Canyon de Chelly. Here distances are deceptive. 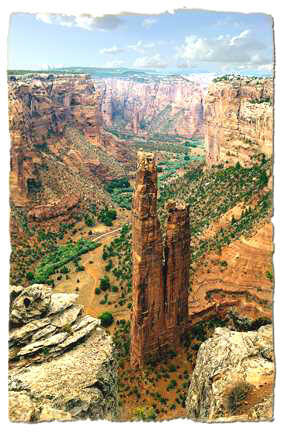 The rock towers over 1,000 feet above the valley, and the wall in the background is miles away. Watch out, don’t get too close to the edge. Window to the Sky©. Once there may have been a flat sandy beach here. Over the ages, wind and water have gradually worn down that beach as the land has lifted into our desert country. Left behind is this magnificent golden arch. Here the arch appears to frame a patch of sky, as well as the remaining life of a twisted old juniper.